Adriana Januszko is currently a Ph. D. candidate in Literature and Linguistics at University of Zielona Góra, Poland and her dissertation focuses on the statistical linguistic analysis of gendered language in John’s Gray series of books Men Are from Mars, Women Are from Venus. She completed her first BA in Polish Language and Editing in 2008, than obtained MA in Media Communication in 2010 and second BA in Russian Language and Business Translations in 2012 at University of Zielona Góra, Poland. During that time she participated in few students exchange programs at the National Institute of Russian Language A.S. Pushkin in Moscow, Russia, at the University of Herzen in St. Petersburg, Russia and Masaryk University in Brno, where she also worked as a lecturer of Polish language. She was also Students Representative abroad at Community Centre MK in Milton Keynes, where she was nominated to Individual Award during Adult Learning Week and participated in SALSA Project organized by The Open University in Milton Keynes. 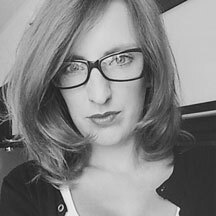 She is also an experienced journalist, editor and proofreader, cooperated with Polish magazines such as Gazeta Wyborcza, Gazeta Lubuska and British platforms Migreat Communities and Edit-place.